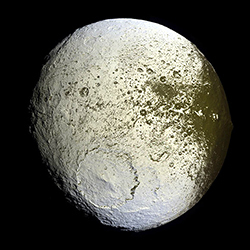 1671: Giovanni Cassini discovers Iapetus, one of Saturn’s moons. And, as it turns out, one of Saturn’s most interesting moons. When the Italian-born astronomer first trained his telescope on the satellite, what he saw was only part of Iapetus (pronounced “eye-AP-i-tus” and named for the son of Uranus and Gaia in Greek mythology) — the bright part. The rest of the moon was obscured from his view because of its darker hue. By continuing to observe Iapetus over a span of several years, and with the aid of a better telescope, Cassini rightly concluded that the moon has both a light and a dark hemisphere. Other theories, including some kind of cosmic collision, remain possible. The moon itself is composed mostly of ice and is heavily cratered and oddly shaped: It bulges in the middle, so is neither typically spheroid or elliptical. This article first appeared on Wired.com Oct. 25, 2007.